LAKE CHARLES, La. — Twelve years to the day after Hurricane Katrina slammed into the Gulf Coast, another deadly storm forced hundreds of people to be rescued from floodwaters in southwestern Louisiana and prompted New Orleans to shut down its schools and other key institutions as a precaution. Tropical Storm Harvey flooded neighborhoods overnight with chest-deep water in the Lake Charles area, near the Texas line. President Donald Trump, moving to expedite federal disaster assistance, issued a federal emergency declaration Monday for five parishes in southwest Louisiana. In New Orleans, Mayor Mitch Landrieu urged residents to stay home Tuesday due to the threat of potential flooding. Many appeared to be heeding his call. Meanwhile, Louisiana Gov.John Bel Edwards said Louisiana is offering to shelter storm victims from Texas. He said at a news conference Tuesday in Baton Rouge that he expects Texas officials to decide within 48 hours whether to accept the offer. Some New Orleans neighborhoods flooded earlier this month during a deluge that exposed problems with the city’s pump and drainage system. On Tuesday, heavy rains were starting to flood some New Orleans streets. Traffic on the bridge from New Orleans’ west bank to the main part of the city was lighter than usual during the morning’s rush hour. The city’s public schools were closed, along with six universities and a medical school. A ceremony and march in New Orleans to commemorate the deadly 2005 storm was postponed until Sunday. For many others, it was largely business as usual. “I can’t afford not to open,” said Jerry Roppolo, 65, owner of a popular coffee house where water often creeps over the sidewalk and up to the threshold during heavy rains. The shop in the Carrollton neighborhood is usually bustling but was slow Tuesday. Roppolo attributed that to the school closures. “A lot of the parents come in on the way to school, on the way from school,” he said. About about 500 people were evacuated in southwest Louisiana’s most populous parish overnight, as a heavy band of rain pushed waterways out of their banks, said Calcasieu Parish spokesman Tom Hoefer. He said as many as 5,000 parish residents are affected by the flooding, but not all of those people have flooded homes. Some are just cut off by flooded roads. A lull in the heavy rains allowed water to recede Tuesday morning, enabling some who fled their homes to return, survey damage and remove possessions. Also on Tuesday the Louisiana SPCA said it has moved about 70 animals to shelters in Georgia and Alabama to make room for animals rescued in Texas from Tropical Storm Harvey. As of Tuesday, authorities had confirmed three storm-related deaths in Texas. No Harvey-related deaths were immediately reported in Louisiana, according to a spokesman for Edwards. The high water in Calcasieu Parish surprised residents of some neighborhoods not known for flooding. The Kayouche Coulee spilled over when heavy rain hit the area after sunset, and people began calling for rescue. “I’ve seen some floods, I’ve seen water come up, but nothing like this,” said Lake Charles Fire Department Division Chief Lennie LaFleur. Residents rode out of neighborhoods in National Guard trucks, wildlife agents’ boats, jacked-up pickups and clinging to the cab of a semi-truck. They carried belongings in suitcases, trash bags or even soggy cardboard boxes. Lt. Mark Thrower of the Iowa Fire Department in Calcasieu Parish said emergency workers used a high-water vehicle and boat to evacuate approximately 25 people from waist-deep water Monday night. Thrower says at least 45 homes in Iowa were flooded. National Weather Service meteorologist Roger Erickson said Tuesday that officials expect Harvey will make another landfall in Cameron Parish around midday Wednesday, after hitting Texas and meandering back into the Gulf of Mexico. Erickson says another 4 to 8 inches of rain is likely across southwest Louisiana. “We are starting to get down to the end of the tunnel of all this rain,” he said. Harvey is projected to bring gusts up to 45 mph in coastal areas and gusts of up to 35 mph in Lake Charles and along the Interstate 10 corridor. Erickson warns that some coastal rivers won’t be able to drain rains effectively because Harvey’s winds are pushing storm surge into coastal waters, aggravating flooding of areas that have already received more than 20 inches of rain. 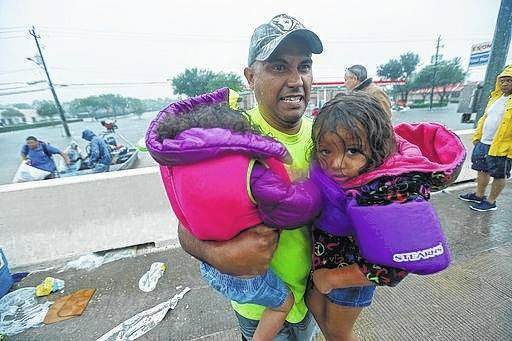 A man carries children after being rescued Monday by members of the Louisiana Department of Wildlife and Fisheries and the the Houston Fire Department after residents were stranded by floodwaters due to Tropical Storm Harvey.